Why do we eat dessert at the end of a meal? The expert on this seems to be Steven Witherly. "As we eat the savory course, we rapidly reduce our hunger pangs and become full — the pleasure of the first course has passed (savory and hot). But as we indulge again with a new set of foods (sweet and cold), our appetite re-energizes — and we indulge in the pleasures of eating once again," Witherly writes in "Why Humans Like Junk Food." In the article on KFC, Witherly says that because humans evolved as foragers, our brains learned to recognize and desire things that pack a lot of calories. The caloric density scale ranges from 0 for water to 9 for pure fat. While raw chicken breast without the skin has a caloric density of 1.35, KFC's original chicken breast scores 2.3; the extra crispy version gets a 2.9. The skin by itself scores an intoxicating 5.0. "Ergo, the chicken is only a vehicle for eating the skin," Witherly wrote. There are 8 more reasons why KFC is so addictive, according to Witherly. They involve high calorie density, salt, MSG, pressure frying, and more. Here's the article HERE. Eating an unbalanced diet high in carbohydrates will cause your blood sugar levels to rise and then drop suddenly after dinner. Our bodies want this "high" again, so we look to sugar. We also experience low blood sugar when we're tired, which causes us to need more carbs for a pick-me-up. If your diet is low in fat, you could put too much strain on the body and cause insulin resistance, during which sugars are not being carried effectively throughout the body. This stress on our bodies leads to a need for sugar. Even if you eat a healthy, balanced diet and have normal serotonin levels, you might still be feeling that you "need" sweets after dinner due to psychological conditioning: Dessert was always what rounded out and finished a meal, so you feel like something is missing if you don't have it. 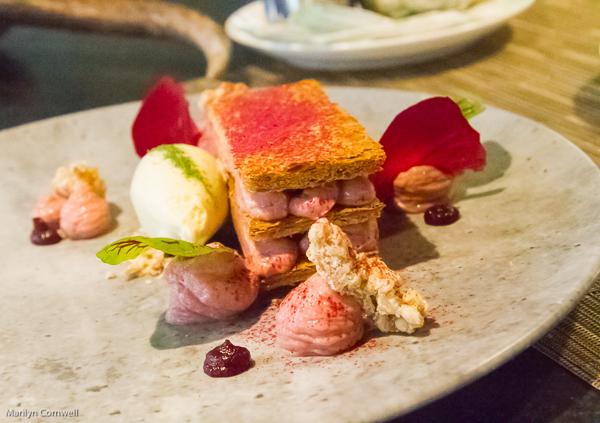 Our picture today is dessert from this year's visit to the restaurant Canoe in Toronto. It has so many interesting and appealing components - ice cream, pastry wafers, custard creme, crispy chips, and even a decorative leaf (rheum). Very appealing, isn't it?